Daffodils immediately bring to mind William Wordsworth’s poem “I Wandered Lonely as a Cloud“. He was inspired to write this in April 1802 when he and his sister Dorothy came across a long belt of daffodils in The Lake District. 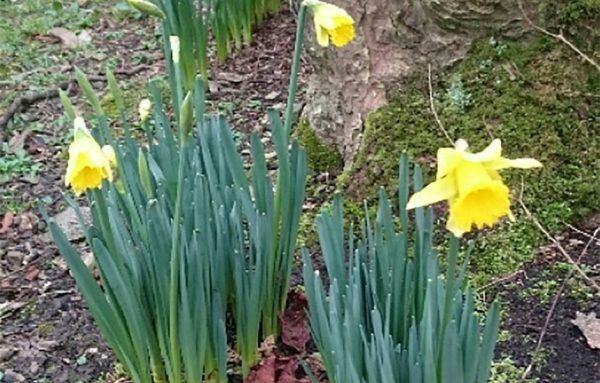 In Swansea, close to our Artstraws factory, the gorgeous sight of daffodils is already greeting us and bringing that long awaited spring feeling. Once you’ve mastered the art of weaving Artstraws, making daffodils and other flowers is quite easy. You will need 5 yellow, thin Artstraws (to weave), 2 thick green Artstraws for the stem and leaves, some small elastic bands and PVA glue. To begin hold the 5 yellow straws together, wind an elastic band tightly around them at one end and another elastic band about 5 cms further along. This section is called the former; the weave will come upwards around it. Keeping the former pointing upwards splay the 5 Artstraws out like the spokes of a bicycle wheel. To begin weaving, hold the straws in your left hand and with your right hand move the straw which is at 4 o’clock over the next 2 straws working anticlockwise. Hold the straw you are moving close to the former, not part way along it. With your left thumb hold the straw you have just moved and turn the work clockwise so that the second straw you passed over is now at four o’clock. Now move the second straw over the next 2 and repeat the process. That’s the basic technique for weaving Artstraws; practice this technique then to learn more click here and scroll down to page 9. Just like knitting, skilful weaving takes practice. From a thick green straw cut off 5 or 6 pieces about 4cm long. They don’t have to be perfectly equal as this will add to the natural look of the flower. Flatten them and cut a long ‘C’ shape out of them; open up the shape to create a lovely leaf. As you can see in our picture we stuck the leaves to the back of the daffodil and then added the stem. If you wish you can stick a piece of cardboard to the back of your daffodil and glue the leaves onto it. With a little creativity the basic daffodil can be turned into a number of imaginary flowers. Use thick and thin white Artstraws to create larger leaves and different stamens. The large white leaves were created in the same way as the green ones, overlapped and trimmed into shape. Click here and scroll down to page 5 to see other ways of making flowers with Artstraws. Please send me a picture of your flowers.